Machu Picchu is definitely not just another ruin. In my view there are very few sights that live up to their hype, the Taj Mahal and the Golden Temple do, and I would now add Machu Picchu to that list. We had arranged with a travel agent in Cusco for a two day package visit to Machu Picchu. This included being picked up from the camp site by taxi, the train ride from Cusco to Machu Picchu and back, the bus to and from the site, entry into the site, our own English speaking guide, and a hotel for one night at Aguas Calientes (the town that wants to be called Machu Picchu Town, but isn't). The trip did not get off to a good start. The taxis were late. Then we discovered that although we would arrive in Aguas Calientes by train, we would not get on the train at Cusco as expected, but would be taken most of the way there by bus and only get on the train at Ollantaytambo. At 05:00 there was nobody to argue with. It is possible to "do" Machu Picchu in one day from Cusco, but definitely not advisable. The train journey (which is part of the fun) takes four hours each way. Ideally you want to be at Machu Picchu in the early morning (say 06:00). Because the trains from Cusco to Machu Picchu only leave early in the morning, even if you take two days you need to get up at 04:30 on each day and you will not be back in Cusco before 21:00. After we had decided to treat our hostel as a joke rather than a problem, we went looking for a recommended restaurant: Indi Feliz . Things then started to look up! 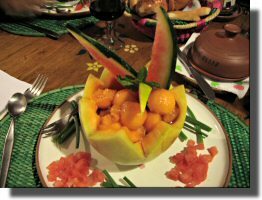 Indi Feliz is a Peruvian-French restaurant run by a French chef producing the most amazing three course meals for about $11USA per person. 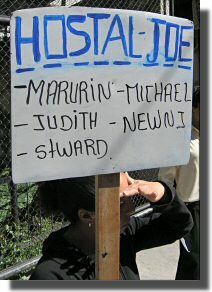 We ate there at lunch time, looked round Aguas Calientes and then ate there again in the evening! Highly recommended. The town of Aguas Calientes is a rather rough-and-ready town with a collection of hostels, bars and restaurants, but somehow manages a pleasant backpacker/hippy ambiance. During the evening we met our guide for the following day, Gloria. (Gloria Miranda Quispe, Phone: 9736319, E-mail glorymoon_mq(at)hotmail.com). Gloria turned out to be an excellent guide who has five years of experience at the Machu Picchu site. 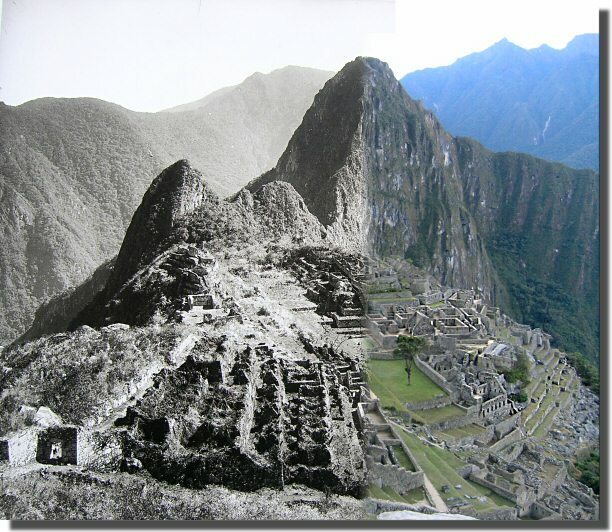 Before that, she walked the four day Inca Trail to Machu Picchu four times a month for four years! Because our visit was on the winter solstice, one of the most important days of the year, Gloria suggested we meet at 05:20 in the morning to get the bus up to Machu Picchu early. Because Machu Picchu is surrounded by jagged mountains, it is not sunrise itself that is the important time, but when the sun's rays reach the various temples and observatories thru the gaps in the surrounding mountains. 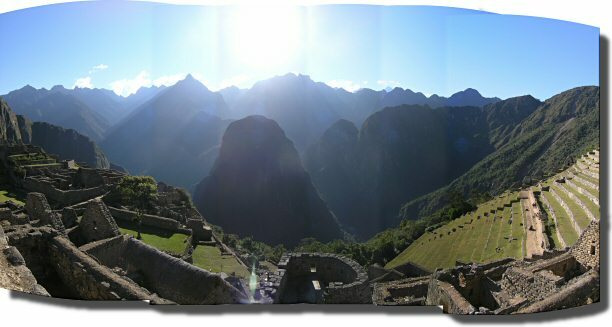 Our first view of Machu Picchu, before the sun had reached the site, was the classic picture-postcard one. Machu Picchu was a small town of less than 1000 people, built by Inca Pachacutec around the mid 15th century, in an absurdly spectacular, and impractical position. It was abandoned before the Spanish arrived in South America and was never found by them. As a result, many of the buildings are in excellent condition. It probably had a religious and military role, but it was also just a very pleasant place for the Inca aristocracy to escape the cold of Cusco. Gloria guided us around the site so that we avoided most of the other tourists and were in the right place as the sun finally illuminated each of the important buildings. The rounded building in the bottom centre is the Temple of the Sun. The Temple of the Sun (seen from below) illustrates many of the features of buildings at Machu Picchu. 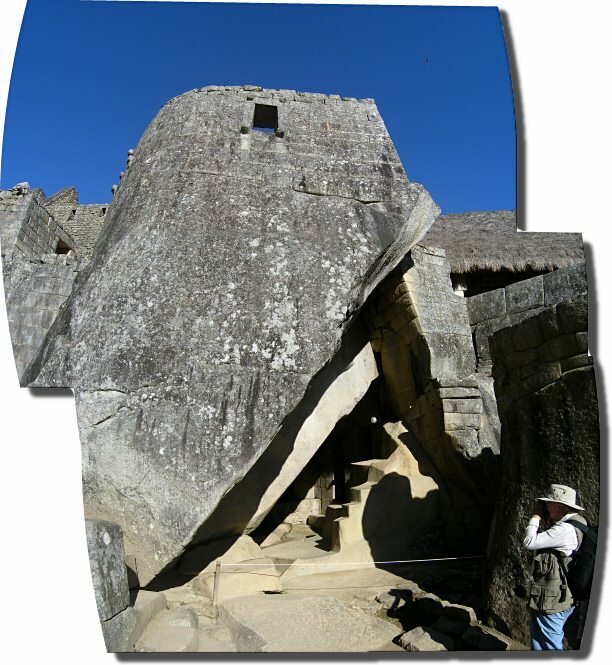 The building combines huge natural rocks (at the bottom), perfect Inca stonework at the top, as well as carved rock (the steps) and "rustic" stonework underneath. The photograph above is a composite of one taken in 1925 and one we took in 2006 showing the extent of the restoration work that has been done. The iconic jagged peak in the background (above right) is known as Waynapicchu and is 2634 metres high. There is an Inca trail/staircase to the top and it can be climbed in about an hour. Only 400 people a day are allowed to attempt the steep and exhausting climb. 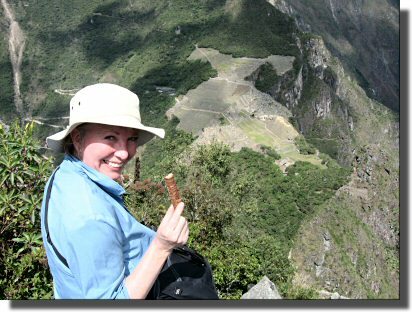 The view of Machu Picchu from the top (right of the Twix bar) is interestingly different from the classic view and well worth the climb. During the day we were surprised at how few tourists there were on site, given that it was one of the two most important days of the year (the winter solstice). 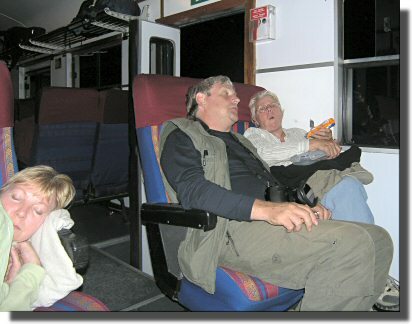 We eventually discovered that the trains from Cusco to Machu Picchu were all cancelled due to a strike, and that the return trains were operating a very limited schedule. Our train to Ollantaytambo was cancelled but we were allowed to take a later train at 17:20. 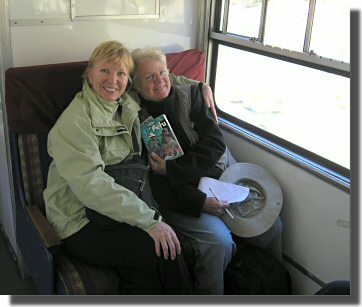 We opted to stay on this train all the way to Cusco, so in spite of our tour agent booking us on the "wrong" train, we did get to experience the famous switch-back ride into Cusco. By then everybody was very tired. Our tour agent redeemed himself, to some extent, by meeting this later train and providing a taxi service back to the camp site. Home - This page last changed on 2006-06-23.